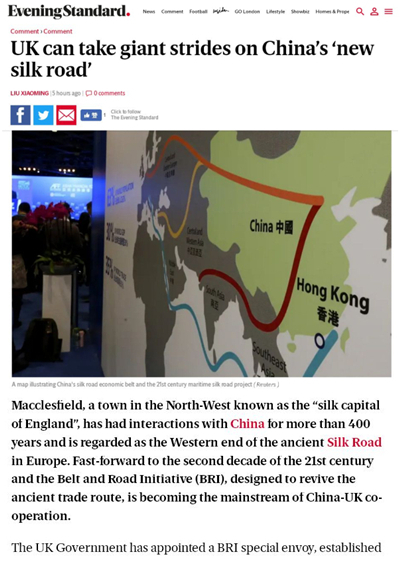 Macclesfield, a town in the North-West known as the "silk capital of England", has had interactions with China for more than 400 years and is regarded as the Western end of the ancient Silk Road in Europe. Fast-forward to the second decade of the 21st century and the Belt and Road Initiative (BRI), designed to revive the ancient trade route, is becoming the mainstream of China-UK co-operation. The UK Government has appointed a BRI special envoy, established an expert board and participated in the Belt and Road Forum Advisory Council. The all-party parliamentary group on the BRI Initiative and China-Pakistan Economic Corridor is looking into policy support and legal guarantees. Joint principles have been issued to address the environmental and social risks of BRI and encourage green investment. China-UK business co-operation is thriving. Latest figures show trade in goods exceeding $80 billion for the first time in 2018 and mutual investments increasing, with direct investment from China up 14 per cent year on year. People-to-people exchanges have flourished, evidenced by 1.5 million mutual visits per year, with 190,000 Chinese students in Britain and more than 10,000 UK students in China. Eight new direct flights were launched last year between Chinese and British cities. Later this month, the second Belt and Road Forum will be held in Beijing. Representatives from more than 100 countries will discuss BRI. This will be a chance to deepen Britain's participation and achieve more results in China-UK co-operation. The first opportunity is rule-making. Britain has played a leading role in the establishment and management of Asian Infrastructure Investment Bank. 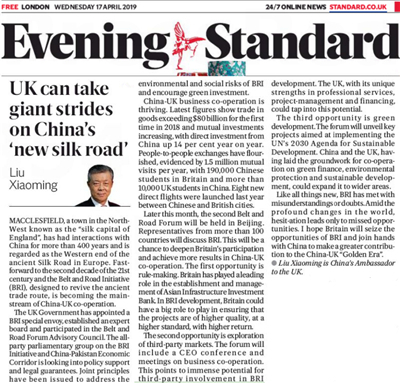 In BRI development, Britain could have a big role to play in ensuring that the projects are of higher quality, at a higher standard, with higher return. The second opportunity is exploration of third-party markets. The forum will include a CEO conference and meetings on business co-operation. This points to immense potential for third-party involvement in BRI development. The UK, with its unique strengths in professional services, project-management and financing, could tap into this potential. The third opportunity is green development. The forum will unveil key projects aimed at implementing the UN's 2030 Agenda for Sustainable Development. China and the UK, having laid the groundwork for co-operation on green finance, environmental protection and sustainable development, could expand it to wider areas. Like all things new, BRI has met with misunderstandings or doubts. Amid the profound changes in the world, hesitation leads only to missed opportunities. I hope Britain will seize the opportunities of BRI and join hands with China to make a greater contribution to the China-UK "Golden Era".